Deep in the forests of central France, an unusual architectural experiment is half-way to completion, as a team of masons replicates in painstaking detail the construction of an entire medieval castle. 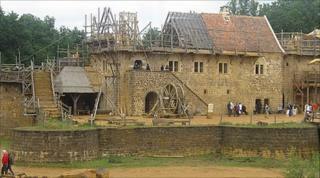 The ­Chateau de Guedelon was started in 1998, after local landowner Michel Guyot wondered whether it would be possible to build a castle from scratch, using only contemporary tools and materials. Today, the walls are rising gradually from the red Burgundy clay. The great hall is almost finished, with only part of the roof remaining, while the main tower edges past the 15m (50ft) mark. Builders use sandstone quarried from the very ground from which the castle is emerging. Modern cement did not exist in the 13th Century, so mortar is made from slaked lime and sand. For tools they have basic ironware. In woods surrounding the castle, craftsmen ply all the trades required for so monumental an endeavour. Stone-cutters and carpenters fashion the raw materials. A blacksmith forges the nails. Ropes, baskets and roof-tiles are all made on site. "The rule is that only what we know from documents that existed at the time is allowed," says Sarah Preston, an English guide. What started out as an eccentric pipe dream is now an established enterprise, drawing in tens of thousands of visitors from around Europe every year. And Guedelon is also highly respected in the academic world. Experts are fascinated by what the experiment can teach about medieval building methods. One example concerns lime kilns, used for making the mortar. Archaeologists had often wondered why they found traces of two separate kilns at construction sites. Experience at Guedelon showed that, in a day's work, builders often needed to top up the mortar brought in from the main kiln with small amounts made close at hand. Hence the small second kiln actually inside the castle. The discolouring of lime-based mortar is another revelation. Within one or two years of being laid, Guedelon's walls are already showing streaks of unsightly white where the lime is leaching. Archaeologists think this is a clue to why medieval castles were very quickly plastered and painted: it was to hide the mess. Mr Guyot, who owns the nearby castle of St Fargeau, teamed up with businesswoman Maryline Martin to launch the project in 1996. Part of the rationale was simply to provide employment for local people. The Guedelon site was chosen because it contained all the necessary materials: plentiful oak from the forests, as well as clay and water. Stone from the quarry had actually been used in the building of real-life medieval chateaux. The castle's design is based on a style made popular by French King Philippe-Auguste in the early 13th Century. An architectural team approves each year's building plans, after a master mason has sketched details from dozens of contemporary castles. Again, nothing that is not referenced in equivalent 13th Century buildings is permitted. "Funnily enough, we found that even though we knew we were being accurate, somehow the castle lacked soul. So we invented a character - the owner - who would have likes and dislikes, wanting this and not wanting that," says Ms Preston. Seigneur Guilbert is a middle-ranking feudal lord, who has been granted the right to build his castle because he sided with the crown during a baronial rebellion in 1226. The rebellion - at the accession of the 12-year-old Louis IX (later Saint Louis) - did actually take place, and was suppressed by his mother Blanche de Castile. In the annals of Guedelon, construction started in 1228. Each year that passes is a year in historical time too, so we are now in 1240. Completion is due around 1253 - or 2023 in today's calendar. What happens when the castle is finally finished, no-one is really sure. One option is to start extending. "Remember, medieval castles were often works in progress. In the 15th Century they might have added new bits with different architectural styles, and then again and again," says Preston. "So we could keep going for ever."